I.C.E. Drive specializes in replicating the sounds of internal combustion engines through limited physical modelling. It can simulate engines of cylinder counts between 2 and 12, and with tweaking can simulate rotary and 2-stroke engine sounds. With simulated forced-induction as well as a virtual transmission that allows the simulation of "driving" the synth much like a real car in a straight line, as well as support for the wireless Xbox 360 Controller for operation, there is no better option on the market. To purchase I.C.E Drive, click the "Buy Now" link below. I.C.E. 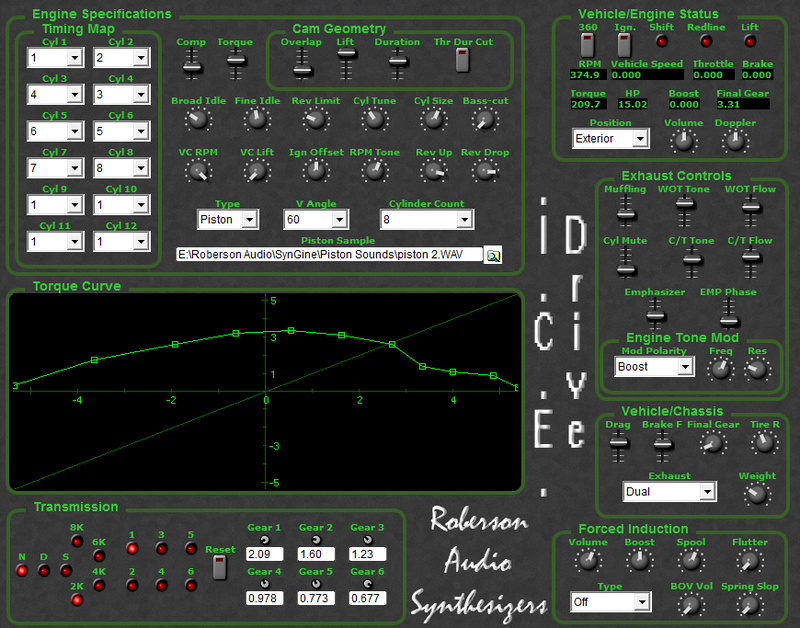 Drive was first and foremost designed as a production tool, to assist in creating engine sound effects for movies, TV shows, games, etc. RAS recognizes, however, that not everyone that would like to enjoy this product is a producer or sound engineer. For that reason, I've created a special feature-limited edition that contains all 32 of the original presets and can be controlled the same way as the fully-featured version, but cannot be tweaked or automated beyond what is seen on the screen. This tool is ideal for car enthusiasts and casual users alike, those that would wish to hear their favorite engine sounds even though they may not own a vehicle with such an engine, or if they do own such an engine and simply want to enjoy the sound while away from the vehicle. To purchase I.C.E Drive PE, click the "Buy Now" link below.